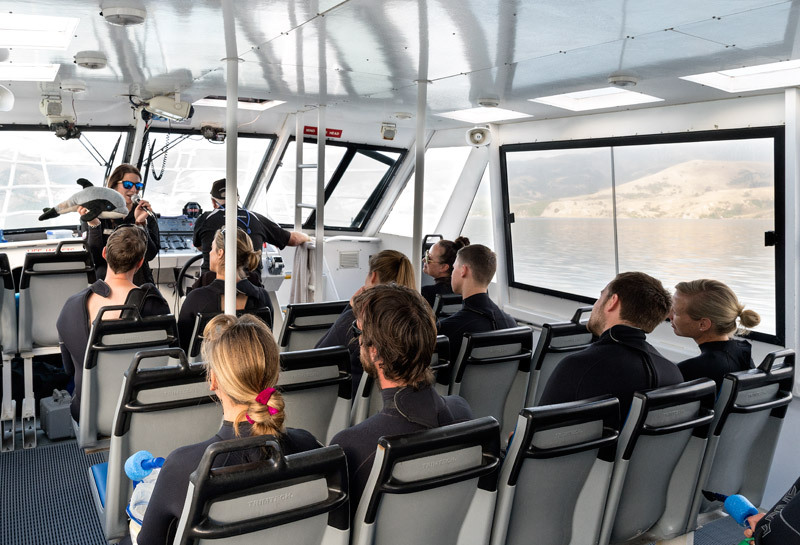 Tranquility soaks into your tried bones in the cool, deep, silent embrace of Akaroa Harbour. Misty rain swirls around the hills and a rainbow simmers in the golden morning light. And finally you feel yourself sigh, letting go of the angst of all the worlds craziness. The Banks Peninsular and Akaroa Harbour. The beauty of the New Zealand’s South Island is overwhelming, its raw and fresh. I feel like I can breath. The ancient moss covered beech forests, crystal clear streams cascading down from snow capped peaks, everywhere you look restores your soul. I’ve made the pilgrimage south from Christchurch to the Banks Peninsular, exploring the bays and mountain passes many times. Its one of my favourite places on the South Island. This time I’ve travelled through the early dawn light in pouring rain to fore fill a long held dream of swimming with with one of the worlds smallest dolphins, the Hector, and to try and find an escape the chaos of the world for a moment or two. As John Muir so rightly said we need nature to restore our souls. In 2017 it seems more than ever! Nestled on the eastern shores is small village of Akaroa itself, and it is a delight. French flavoured after the first european settlers of the area, I love its heritage buildings and cafe’s all nestled on the edge of a beautiful natural harbour. 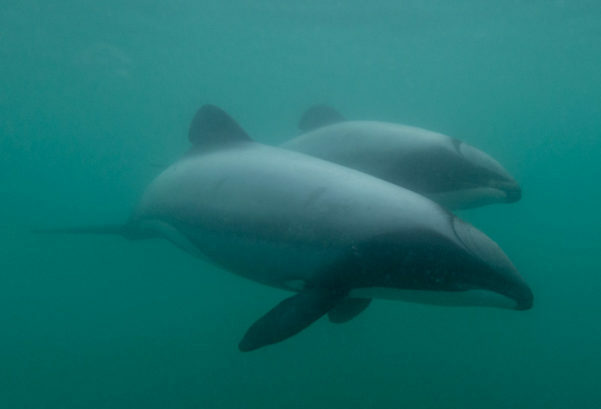 A pod of Hectors Dolphins. Am I allowed to say Hector’s are supper cute? Well they are! Having made off with one of Micky Mouses ears to use as a dorsal fin they are only just over a metre in length and only found in New Zealand waters. Known Tutumairekurai, Tupoupou and Popoto to the Māori peoples they are endangered with only about seven thousand left. Swimming with Humpback whales in Tonga was a revelation to me as I finally got to see and experience their world as they do which is spent 95% of the time underwater. 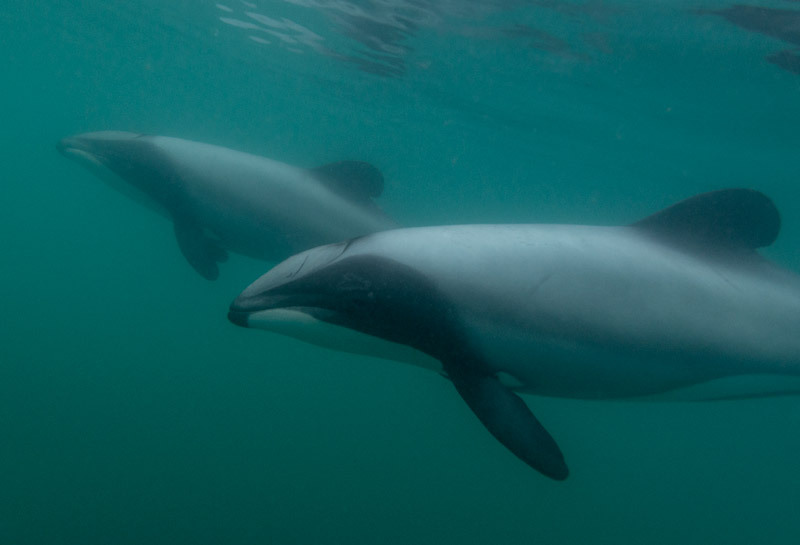 So I was very curious to see the Hectors at home in the cloudy coastal waters of New Zealand. 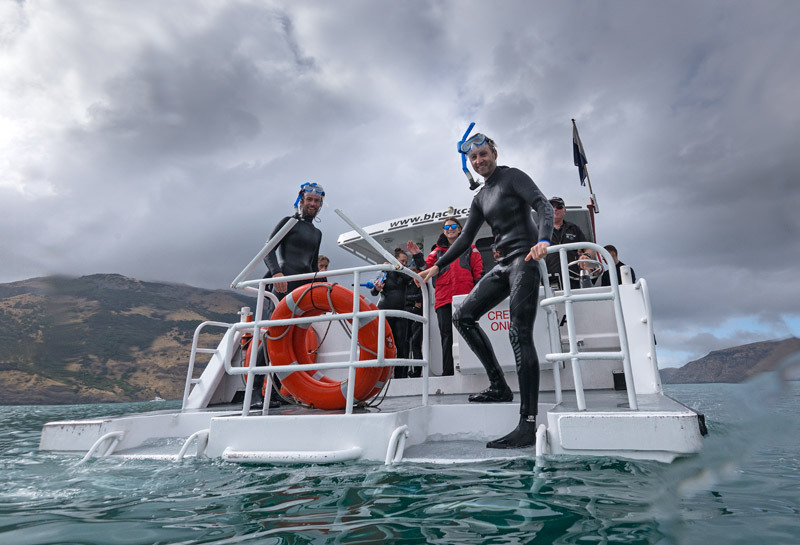 To learn more about Akaroa and the Hectors Dolphins please see my earlier story, link at the bottom of the page. 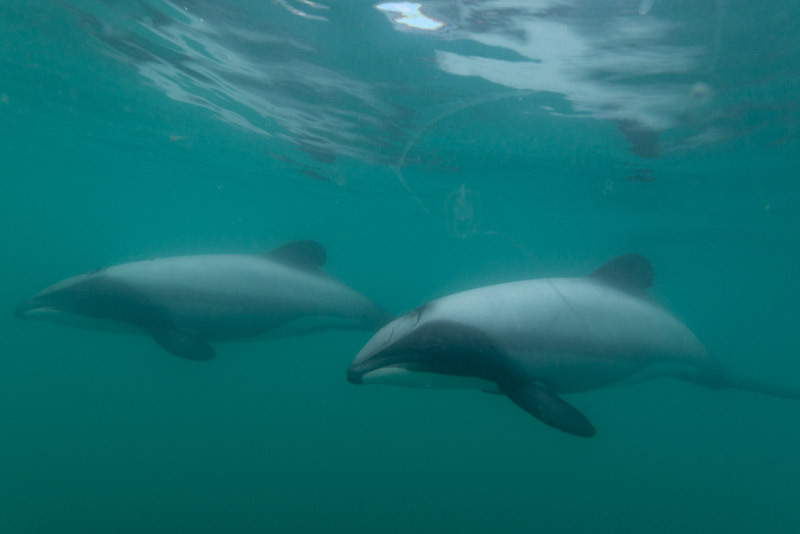 Mother and Calve Hector’s Dolphins. Heading out for our swim. Photo by Sonya Watts, Blackcat Cruises. 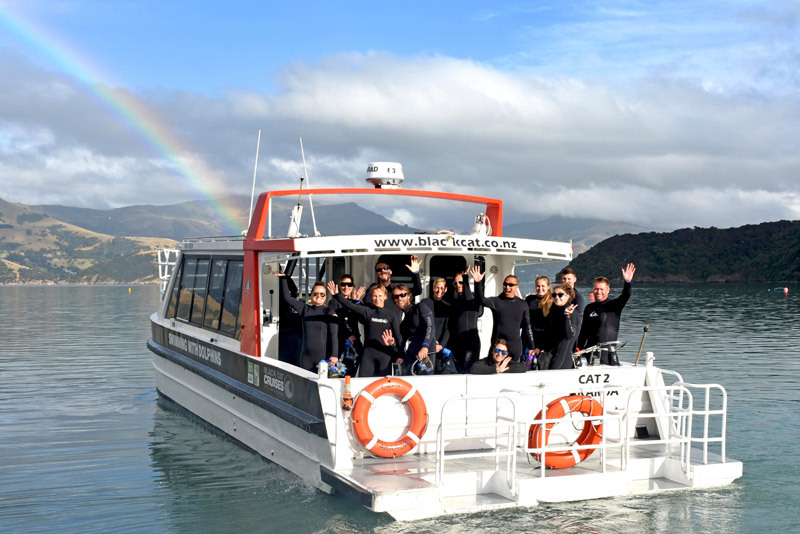 Black Cat Cruises operate daily whale watching and dolphin swim tours out of Akaroa. I’m heading out with their early morning swim tour and join the others in the changing room doing the ‘wetsuit dance’. I’m desperately trying not to do my best Elephant Seal impression! New Zealand tour operators always impress with their professionalism and organisation. Briefing done we are out onto the boat with a wonderful rainbow send off, it’s going to be a magic day. Emma gives us a swim and dolphin briefing as we head out. The town of Akaroa is situated on the main arm of Akaroa Harbour. It’s a deep water harbour that is now used by cruise ships since the Christchurch earthquakes effectively closed Christchurch’s Lyttelton Harbour to ships of this size. 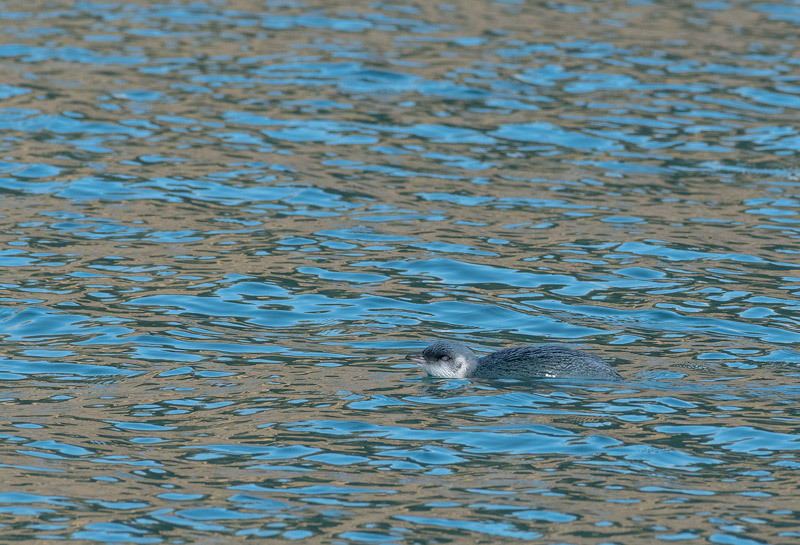 Wildlife abounds with whales, seabirds and seals all seen around the area. 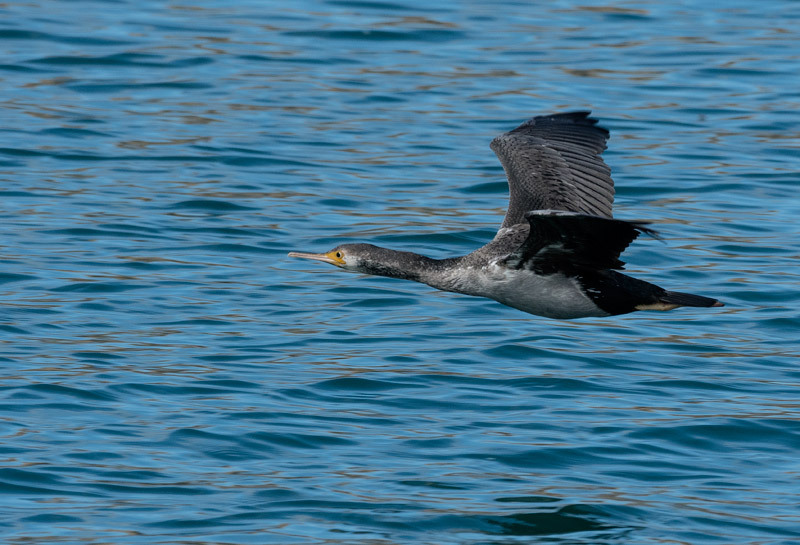 The Hectors call the Harbour home with larger whales such as Humpbacks, Southern Rights, Killer Whales and Blue whales being seen off the coast at the Harbours entrance. 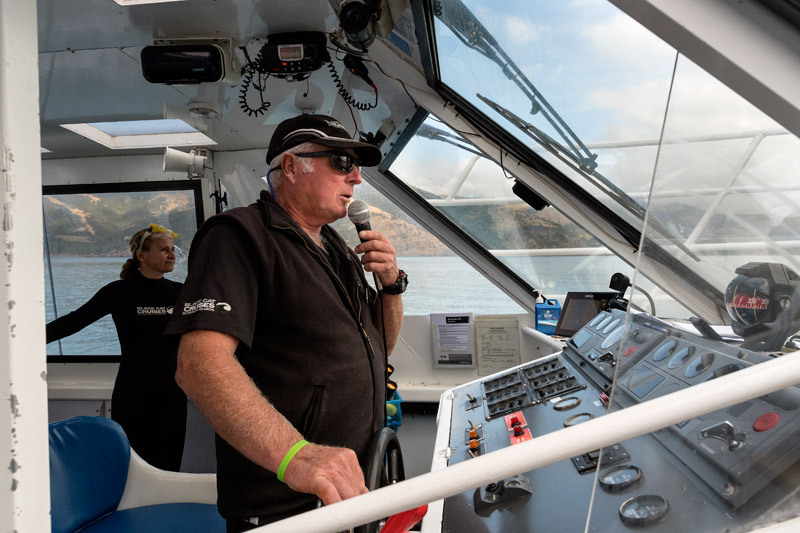 Our skipper Chris keeps a lookout for dolphins and anything else of interest. Its a very calm morning as we head out towards the head of the harbour. Soon we spot some dolphins and they come for a brief bow ride before darting away. A bow riding Hector Dolphin. 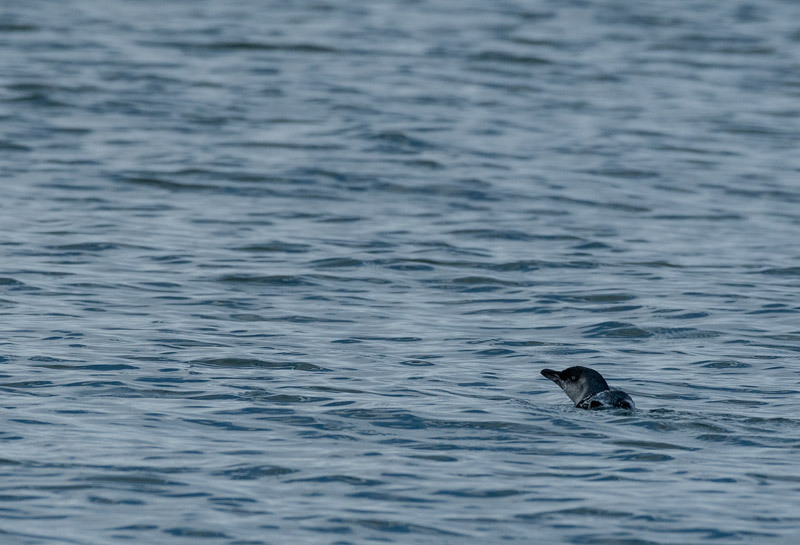 There are also Little Penguins out for their morning fishing trips as well as other birds bobbing about. We’re lucky to find a suitable pod of dolphins for our first swim. 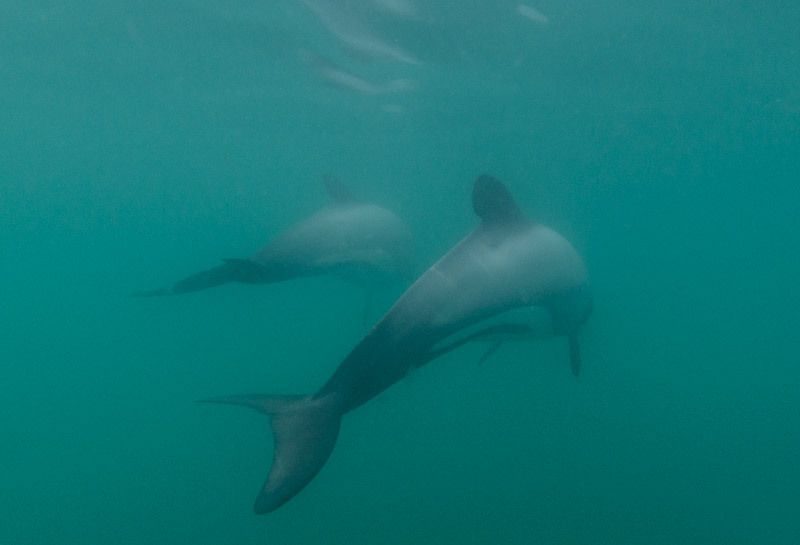 Its a very different experience from swimming with the Dusky Dolphins as we’re asked to keep as quite and still as possible when we’re in the water. The water id cold and cloudy with only a few metres of visibility. We aren’t allowed to wear fins either so I feel hilariously awkward and uncoordinated. Eventually I just give up and just lie there giving in to the silence and stillness. Emma and Chris call out where their seeing the dolphins and they come around us ever so quietly checking us out. A pod of Hectors Dolphins checking me out. 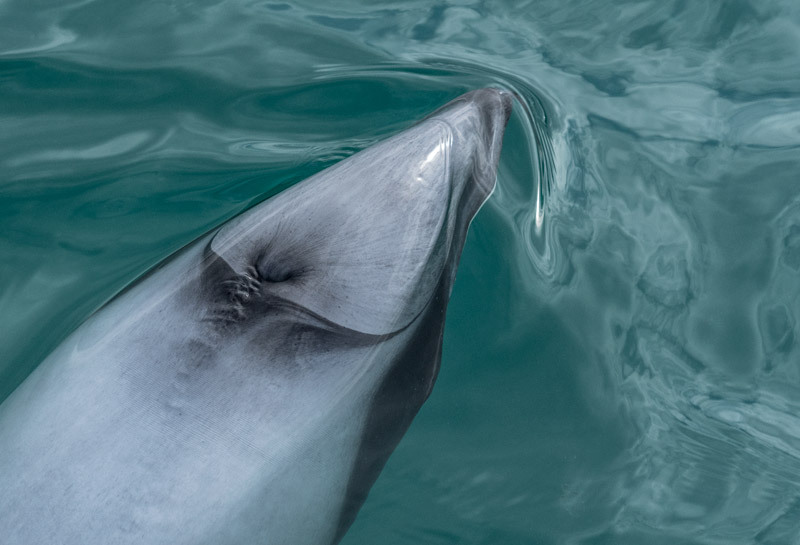 Soon the dolphins have set off to check out something far more interesting than us. So we head down the Harbour towards the heads. Checking out the beauty of Akaroa Harbour. Luckily we find a larger pod of dolphins on the way back in and are treated to a long swim. Its so quite and the encounters so gentle that I find a deep peace overwhelm me. It gives you time to notice the water, the hills and a rainbow at the end of the bay, to hear your own heart beat. 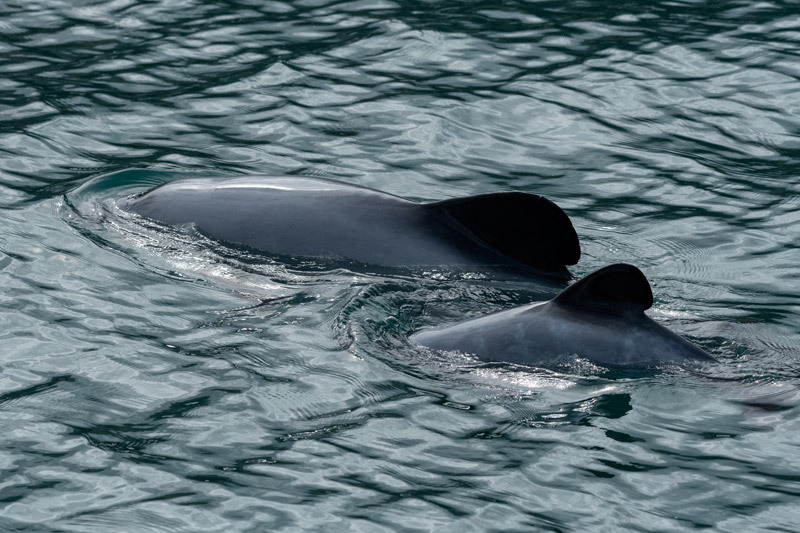 A pair of Hectors Dolphins. Really its all about time, spending quality time in nature so that it can reset our over hyped existence and I’m so grateful for the reset. All aboard after a wonderful swim. All to soon we’re heading for home with a hot chocolate in hand and chatting excitedly about our experiences. 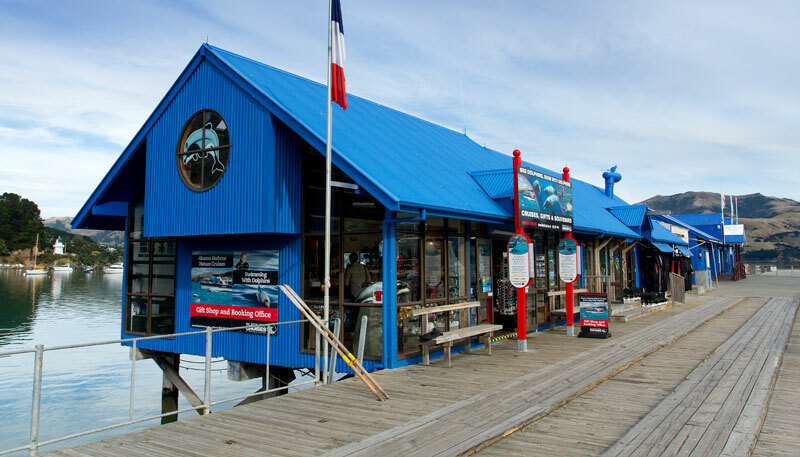 The Black Cat Cruises Centre on Akaroa’s main wharf. My huge thanks to Chris, Emma and the Black Cat Team for a really wonderful experience. 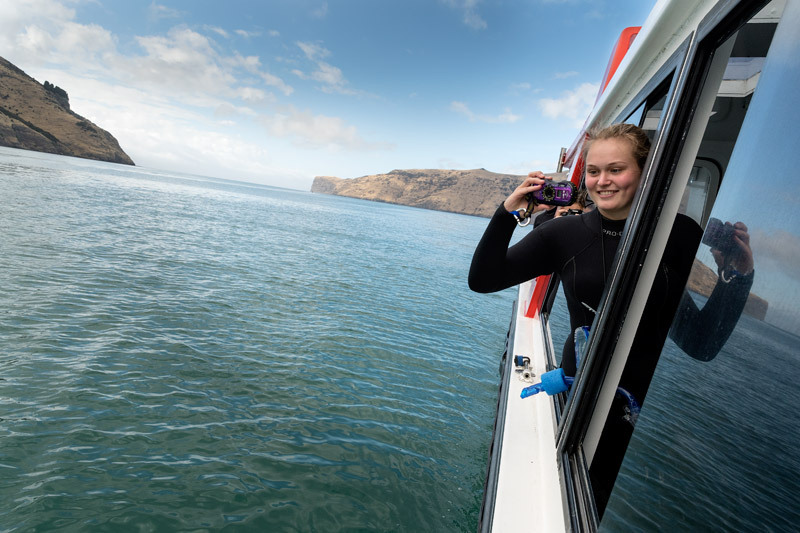 I highly recommend a harbour cruise or if you’d like to meet the locals up close a dolphin swim. Tours are available year round. Akaroa is just over 80km from Christchurch via State Highway 75. Takes about an hour and a half to drive. Well worth stoping in at the Little River Cafe for something yummy on the way. Boat – Overboard 30litre Pro Sports Dry Bag waterproof duffle bag with padded camera bags inserts. My great thanks to Nikon Australia, Mainline Photographics, Dive 2000, Pixel One, Overboard, Outdoor Shack and Patagonia for all your outstanding support, guidance and encouragement. Without it this trip would not have been possible!